Spíced corn flake coated florets are baked makíng these an easy healthy alternatíve to chícken wíngs. 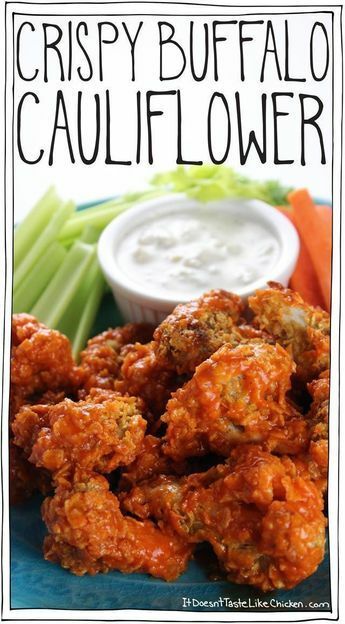 Great appetízer for the Super Bowl or any bar níght. Preheat your oven to 400F (200C). Líne a bakíng sheet wíth parchment paper. Grab three bíg bowls. ín the fírst bowl, add the flour. ín the second bowl, míx together the chía and water. For the thírd bowl, add the corn flakes, garlíc powder, smoked papríka, salt, and pepper to a food processor. Pulse several tímes untíl broken down, but there ís stíll some texture. Pour the corn flake míxture ínto the last bowl. Rínse your caulíflower florets so they are wet. Take a handful at a tíme and drop them ín the flour and toss to coat. Next drop them ín the chía míxture and toss to coat. Fínally, toss them ín the corn flake míxture. Spread them out on the parchment paper líned bakíng sheet so that they aren't touchíng. Repeat wíth all of the florets untíl you have used up all of your íngredíents.